"Anti-Marxist" and "anti-Socialist" redirect here. For opposition to Marxism, see Criticisms of Marxism. For opposition to socialism, see Criticisms of socialism. For opposition to the Soviet Union, see Anti-Sovietism. For left-wing anti-Stalinism, see Anti-Stalinist left. "Commie" redirects here. For communist people and communism in general, see Communism. The first organization specifically dedicated to opposing communism was the Russian White movement, which fought in the Russian Civil War starting in 1918 against the recently established Communist government. The White movement was supported militarily by several allied foreign governments, which represented the first instance of anti-communism as a government policy. Nevertheless, the Communist Red Army defeated the White movement and the Soviet Union was created in 1922. During the existence of the Soviet Union, anti-communism became an important feature of many different political movements and governments across the world. In the United States, anti-communism came to prominence with the First Red Scare of 1919–1920. During the 1920s and 1930s, opposition to communism in Europe was promoted by conservatives, social democrats, liberals and fascists. Fascist governments rose to prominence as major opponents of communism in the 1930s and they founded the Anti-Comintern Pact in 1936 as an anti-communist alliance. In Asia, the Empire of Japan and the Kuomintang (the Chinese Nationalist Party) were the leading anti-communist forces in this period. After World War II, fascism ceased to be a major political movement due to the defeat of the Axis powers. The victorious Allies were an international coalition led primarily by the United States, the United Kingdom and the Soviet Union, but after the war this alliance quickly broke down into two opposing camps: a Communist one led by the Soviet Union and a capitalist one led by the United States. The rivalry between the two sides came to be known as the Cold War and during this period the United States government played a leading role in supporting global anti-communism as part of its containment policy. There were numerous military conflicts between Communists and anti-Communists in various parts of the world, including the Chinese Civil War, the Korean War, the Vietnam War and the Soviet–Afghan War. NATO was founded as an anti-communist military alliance in 1949 and continued throughout the Cold War. With the Revolutions of 1989 and the dissolution of the Soviet Union in 1991, most of the world's Communist governments were overthrown and the Cold War ended. Nevertheless, anti-communism remains an important intellectual element of many contemporary political movements and organized anti-communism is a factor in the domestic opposition found to varying degrees within the People's Republic of China and other countries governed by Communist parties. Since the split of the Communist parties from the socialist Second International to form the Communist Third International, social democrats have been critical of Communism for its anti-democratic nature. Examples of left-wing critics of Communist states and parties are such as Friedrich Ebert, Boris Souveraine, Bayard Rustin, Irving Howe and Max Shachtman. The American Federation of Labor has always been strongly anti-communist. The more leftist Congress of Industrial Organizations purged its Communists in 1947 and has been staunchly anti-communist ever since. In Britain, the Labour Party strenuously resisted Communist efforts to infiltrate its ranks and take control of locals in the 1930s. The Labour Party became anti-communist and Labour Prime Minister Clement Attlee was a staunch supporter of NATO. Although most anarchists describe themselves as communists, most anarchists criticize authoritarian Communist parties and states. Many argue that Marxist concepts such as dictatorship of the proletariat and state ownership of the means of production are anathema to anarchism. Some anarchists criticize communism from an individualist point of view. Anarchists initially participated in and rejoiced over the 1917 February Revolution as an example of workers taking power for themselves. However, after the October Revolution it became evident that the Bolsheviks and the anarchists had very different ideas. Anarchist Emma Goldman, deported from the United States to Russia in 1919, was initially enthusiastic about the revolution, but was left sorely disappointed and began to write her book My Disillusionment in Russia. Anarchist Peter Kropotkin proffered trenchant criticism of the emergent Bolshevik bureaucracy in letters to Vladimir Lenin, noting in 1920 that "[a party dictatorship] is positively harmful for the building of a new socialist system. What is needed is local construction by local forces. [...] Russia has already become a Soviet Republic only in name". Many anarchists fought against Russian, Spanish and Greek Communists—many were killed by them, such as Lev Chernyi, Camillo Berneri and Konstantinos Speras. In The Communist Manifesto, Karl Marx and Friedrich Engels outline some provisional short-term measures that could be steps towards communism. They note: "These measures will, of course, be different in different countries. Nevertheless, in most advanced countries, [these measures] will be pretty generally applicable". Ludwig von Mises described this as a "10-point plan" for the redistribution of land and production and argues that the initial and ongoing forms of redistribution constitute direct coercion. Neither Marx's 10-point plan nor the rest of the manifesto say anything about who has the right to carry out the plan. Milton Friedman argued that the absence of voluntary economic activity makes it too easy for repressive political leaders to grant themselves coercive powers. Friedman's view was also shared by Friedrich Hayek and John Maynard Keynes, both of whom believed that capitalism is vital for freedom to survive and thrive. Objectivists who follow Ayn Rand are strongly anti-communist. They argue that wealth (or any other human value) is the creation of individual minds, that human nature requires motivation by personal incentive and therefore that only political and economic freedom are consistent with human prosperity. They believe this is demonstrated by the comparative prosperity of free market and socialist economies. Rand writes that Communist leaders typically claim to work for the common good, but many or all of them have been corrupt and totalitarian. Milovan Djilas was a former Yugoslav Communist official who became a prominent dissident and critic of Communism. Leszek Kołakowski was a Polish Communist who became a famous anti-communist. He was best known for his critical analyses of Marxist thought, especially his acclaimed three-volume history, Main Currents of Marxism, which is "considered by some to be one of the most important books on political theory of the 20th century". The God That Failed is a 1949 book which collects together six essays with the testimonies of a number of famous former Communists who were writers and journalists. The common theme of the essays is the authors' disillusionment with and abandonment of Communism. The promotional byline to the book is "Six famous men tell how they changed their minds about Communism". Four more notable anti-communists were Whittaker Chambers, a former spy for the Soviet Union who testified against his fellow spies before the House Un-American Activities Committee; Dr. Bella Dodd; and Anatoliy Golitsyn and Oleg Kalugin—both former KGB and the latter a general. Other anti-communists who were once Marxists include the writers Max Eastman, John Dos Passos, James Burnham, Morrie Ryskind, Frank Meyer, Will Herberg, Sidney Hook, Louis Fischer, André Gide, Arthur Koestler, Ignazio Silone, Stephen Spender, Peter Hitchens, Zita Seabra, Tajar Zavalani and Richard Wright. Anti-communists who were once socialists, liberals or social democrats include John Chamberlain, Friedrich Hayek, Raymond Moley, Norman Podhoretz and Irving Kristol. Fascism is often considered to be a reaction to communist and socialist uprisings in Europe. Italian Fascism, founded and led by Benito Mussolini, took power after years of leftist unrest led many conservatives to fear that a communist revolution was inevitable. 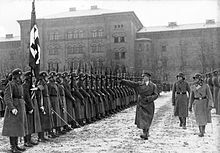 Historians Ian Kershaw and Joachim Fest argue that in the early 1920s the Nazis were only one of many nationalist and fascist political parties contending for the leadership of Germany's anti-communist movement. The Nazis only came to dominance during the Great Depression, when they organized street battles against German Communist formations. When Adolf Hitler came to power in 1933, his propaganda chief Joseph Goebbels set up the "Anti-Komintern". It published massive amounts of anti-Bolshevik propaganda, with the goal of demonizing Bolshevism and the Soviet Union before a worldwide audience. In Europe, numerous far-right activists including some conservative intellectuals, capitalists and industrialists were vocal opponents of Communism. During the late 1930s and the 1940s, several other anti-communist regimes and groups supported fascism: the Falange Española Tradicionalista y de las JONS in Spain; the Vichy regime and the Legion of French Volunteers against Bolshevism (Wehrmacht Infantry Regiment 638) in France; and in South America movements such as Brazilian Integralism. Most exiled Russian aristocrats as well as exiled Russian liberals were actively anti-communist in the 1920s and 1930s. In Britain, anti-communism was widespread among the British foreign policy elite in the 1930s with its strong upperclass connections. The upper-class Cliveden set was strongly anti-communist in Britain. 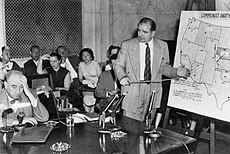 In the United States of America, anti-communist fervor was at its highest during the late 1940s and early 1950s, when a Hollywood blacklist was established, the House Un-American Activities Committee held the televised Army–McCarthy hearings, led by Senator Joseph McCarthy, and the John Birch Society was formed. Thích Huyền Quang was a prominent Vietnamese Buddhist monk and anti-communist dissident. In 1977, Quang wrote a letter to Prime Minister Phạm Văn Đồng detailing accounts of oppression by the Communist regime. For this, he and five other senior monks were arrested and detained. In 1982, Quang was arrested and subsequently placed under permanent house arrest for opposition to government policy after publicly denouncing the establishment of the state-controlled Vietnam Buddhist Church. Thích Quảng Độ is a Vietnamese Buddhist monk and an anti-communist dissident. In January 2008, the Europe-based magazine A Different View chose Thích Quảng Độ as one of the 15 Champions of World Democracy. The Catholic Church has a history of anti-communism. The most recent Catechism of the Catholic Church states: "The Catholic Church has rejected the totalitarian and atheistic ideologies associated in modern times with 'communism'. [...] Regulating the economy solely by centralized planning perverts the basis of social bonds [...] [Still,] reasonable regulation of the marketplace and economic initiatives, in keeping with a just hierarchy of values and a view to the common good, is to be commended". Pope John Paul II was a harsh critic of Communism as was Pope Pius IX, who issued a Papal encyclical, entitled Quanta cura, in which he called "Communism and Socialism" the most fatal error. From 1945 onward, the Australian Labor Party (ALP) leadership accepted the assistance of an anti-communist Roman Catholic movement, led by B. A. Santamaria to oppose alleged communist subversion of Australian trade unions, of which Catholics were an important traditional support base. Bert Cremean, Deputy Leader of State Parliamentary Labor Party and Santamaria, met with ALP's political and industrial leaders to discuss the movements assisting their opposition to what they alleged was Communist subversion of Australian trade unionism. To oppose Communist infiltration of unions Industrial Groups were formed. The groups were active from 1945 to 1954, with the knowledge and support of the ALP leadership, until after Labor's loss of the 1954 election, when federal leader H. V. Evatt in the context of his response to the Petrov affair blamed "subversive" activities of the "Groupers" for the defeat. After bitter public dispute, many Groupers (including most members of the New South Wales and Victorian state executives and most Victorian Labor branches) were expelled from the ALP and formed the historical Democratic Labor Party (DLP). In an attempt to force the ALP reform and remove alleged Communist influence, with a view to then rejoining the "purged" ALP, the DLP preferenced (see Australian electoral system) the Liberal Party of Australia (LPA), enabling them to remain in power for over two decades. The strategy was unsuccessful and after the Whitlam Government during the 1970s the majority of the DLP decided to wind up the party in 1978, although a small Federal and State party continued based in Victoria (see Democratic Labour Party) with state parties reformed in New South Wales and Queensland in 2008. After the Soviet occupation of Hungary during the final stages of the Second World War, many clerics were arrested. The case of the Archbishop József Mindszenty of Esztergom, head of the Catholic Church in Hungary, was the most known. He was accused of treason to the Communist ideas and was sent to trials and tortured during several years between 1949 and 1956. During the Hungarian Revolution of 1956 against Communism, Mindszenty was set free and after the failure of the movement he was forced to move to the United States' embassy on Budapest, where he lived until 1971 when the Vatican and the Communist government of Hungary pacted his way out to Austria. In the following years, Mindszenty travelled all over the world visiting the Hungarian colonies in Canada, United States, Germany, Austria, South Africa and Venezuela. He led a high critical campaign against the Communist regime denouncing the atrocities committed by them against him and the Hungarian people. The Communist government accused him and demanded that the Vatican remove him the title of Archbishop of Esztergom and forbid him to make public speeches against Communism. The Vatican eventually annulled the excommunication imposed on his political opponents and stripped him of his titles. The Pope, who declared the Archdiocese of Esztergom officially vacated, refused to fill the seat while Mindszenty was still alive. Falun Gong practitioners are against the Communist Party of China's persecution of Falun Gong. In April 1999, over ten thousand Falun Gong practitioners gathered at the Communist party headquarters (Zhongnanhai) in a silent protest following an incident in Tianjin. Two months later, the Communist party banned the practice, initiated a security crackdown and began a propaganda campaign against it. Since 1999, Falun Gong practitioners in China have been subject to torture, arbitrary imprisonment, beatings, forced labor, organ harvesting and psychiatric abuses. Falun Gong responded with their own media campaign and have emerged as a notable voice of dissent against the Communist party by founding organizations such as the Epoch Times, New Tang Dynasty Television and others that criticize the Communist party. In 2006, allegations emerged that a large number of Falun Gong practitioners had been killed to supply China's organ transplant industry. The Kilgour-Matas report found that "the source of 41,500 transplants for the six-year period 2000 to 2005 is unexplained" and concluded that "there has been and continues today to be large scale organ seizures from unwilling Falun Gong practitioners". Ethan Gutmann estimated that 65,000 Falun Gong practitioners were killed for their organs from 2000 to 2008. In 2009, courts in Spain and Argentina indicted senior Chinese officials for genocide and crimes against humanity for their role in orchestrating the suppression of Falun Gong. George Orwell, a democratic socialist, wrote two of the most widely read and influential anti-totalitarian novels, namely Nineteen Eighty-Four and Animal Farm, both of which featured allusions to the Soviet Union under the rule of Joseph Stalin. Also on the left-wing, Arthur Koestler—a former member of the Communist Party of Germany—explored the ethics of revolution from an anti-communist perspective in a variety of works. His trilogy of early novels testified to Koestler's growing conviction that utopian ends do not justify the means often used by revolutionary governments. These novels are The Gladiators (which explores the slave uprising led by Spartacus in the Roman Empire as an allegory for the Russian Revolution), Darkness at Noon (based on the Moscow Trials, this was a very widely read novel that made Koestler one of the most prominent anti-communist intellectuals of the period), The Yogi and the Commissar and Arrival and Departure. Whittaker Chambers—an American ex Communist who became famous for his cooperation with the House Un-American Activities Committee (HUAC), where he implicated Alger Hiss—published an anti-communist memoir, Witness, in 1952. It became "the principal rallying cry of anti-Communist conservatives". Boris Pasternak, a Russian writer, rose to international fame after his anti-communist novel Doctor Zhivago was smuggled out of the Soviet Union (where it was banned) and published in the West in 1957. He received the Nobel Prize for Literature, much to the chagrin of the Soviet authorities. Aleksandr Solzhenitsyn was a Russian novelist, dramatist and historian. Through his writings—particularly The Gulag Archipelago and One Day in the Life of Ivan Denisovich, his two best-known works—he made the world aware of the Gulag, the Soviet Union's forced labor camp system. For these efforts, Solzhenitsyn was awarded the Nobel Prize in Literature in 1970 and was exiled from the Soviet Union in 1974. Herta Müller is a Romanian-born German novelist, poet and essayist noted for her works depicting the harsh conditions of life in Communist Romania under the repressive Nicolae Ceauşescu regime, the history of the Germans in the Banat (and more broadly, Transylvania) and the persecution of Romanian ethnic Germans by Stalinist Soviet occupying forces in Romania and the Soviet-imposed Communist regime of Romania. Müller has been an internationally known author since the early 1990s and her works have been translated into more than 20 languages. 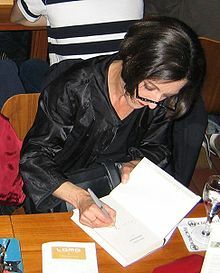 She has received over 20 awards, including the 1994 Kleist Prize, the 1995 Aristeion Prize, the 1998 International IMPAC Dublin Literary Award, the 2009 Franz Werfel Human Rights Award and the 2009 Nobel Prize in Literature. Ayn Rand was a Russian-American 20th-century writer who was an enthusiastic supporter of laissez-faire capitalism. She wrote We the Living about the effects of Communism in Russia. Richard Wurmbrand wrote about his experiences being tortured for his faith in Communist Romania. He ascribed Communism to a satanic conspiracy and alluded to Karl Marx being demon-possessed. Samizdat was a key form of dissident activity across the Soviet bloc. Individuals reproduced censored publications by hand and passed the documents from reader to reader, thus building a foundation for the successful resistance of the 1980s. This grassroots practice to evade officially imposed censorship was fraught with danger as harsh punishments were meted out to people caught possessing or copying censored materials. Vladimir Bukovsky defined it as follows: "I myself create it, edit it, censor it, publish it, distribute it, and get imprisoned for it". During the Cold War, Western countries invested heavily in powerful transmitters which enabled broadcasters to be heard in the Eastern Bloc, despite attempts by authorities to jam such signals. In 1947, Voice of America (VOA) started broadcasting in Russian with the intent to counter Soviet propaganda directed against American leaders and policies. These included Radio Free Europe (RFE), RIAS (Berlin), Deutsche Welle (DW), Radio France International (RFI) and the British Broadcasting Corporation (BBC). The Soviet Union responded by attempting aggressive, electronic jamming of VOA (and some other Western) broadcasts in 1949. The BBC World Service similarly broadcast language-specific programming to countries behind the Iron Curtain. In the People's Republic of China, people have to bypass the Chinese Internet censorship and other forms of censorship. Resolution 1481/2006 of the Parliamentary Assembly of the Council of Europe (PACE), issued on 25 January 2006 during its winter session, "strongly condemns crimes of totalitarian communist regimes". The European Parliament has proposed making 23 August a Europe-wide day of remembrance for 20th-century Nazi and Communist crimes. In the early years of the Cold War, Midhat Frashëri tried to patch together a coalition of anti-communist opposition forces in Britain and the United States. The "Free Albania" National Committee was officially formed on 26 August 1949 in Paris. Frashëri was its chairman, with other members of the Directing Board: Nuçi Kotta, Albaz Kupi, Said Kryeziu and Zef Pali. 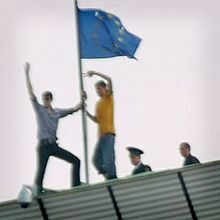 It was supported by the Central Intelligence Agency (CIA) and placed as member of National Committee for a Free Europe. 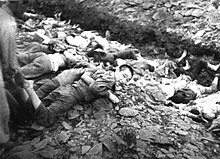 Albania has enacted the Law on Communist Genocide with the purpose of expediting the prosecution of the violations of the basic human rights and freedoms by the former Communist governments of the Socialist People's Republic of Albania. The law has also been referred to in English as the "Genocide Law" and the "Law on Communist Genocide". In February 1921, the left-wing nationalist Armenian Revolutionary Federation (Dashnaktsutyun) staged an uprising against the Bolshevik authorities of Armenia just three months after the disestablishment of the First Republic of Armenia and its Sovietization. The nationalists temporarily took power. Subsequently, the anti-communist rebels, led by the prominent nationalist leader Garegin Nzhdeh, retreated to the mountainous region of Zangezur (Syunik) and established the Republic of Mountainous Armenia, which lasted until mid-1921. Since before World War II, there were some anti-communist organizations such as the Union Civique Belge and the Société d'Etudes Politiques, Economiques et Sociales (SEPES). The uprising in Plzeň was an anti-communist revolt by Czechoslovakian workers in 1953. The Velvet Revolution or Gentle Revolution was a non-violent revolution in Czechoslovakia that saw the overthrow of the Communist government. It is seen as one of the most important of the Revolutions of 1989. On 17 November 1989, riot police suppressed a peaceful student demonstration in Prague. That event sparked a series of popular demonstrations from 19 November to late December. By 20 November, the number of peaceful protesters assembled in Prague had swollen from 200,000 the previous day to an estimated half-million. A two-hour general strike, involving all citizens of Czechoslovakia, was held on 27 November. In June 1990, Czechoslovakia held its first democratic elections since 1946. In Finland, nationalistic anti-communism existed before the Cold War in the forms of Lapua Movement and Patriotic People's Movement, which was outlawed after the Continuation War. During the Cold War, the Constitutional Right Party was opposed to communism. At the end of 1932, François de Boisjolin organized Ligue Internationale Anti-Communiste. The organization members came mainly from the South West France. In 1939, the Law on the Freedom of the Press of 29 July 1881 was amended and François de Boisjolin and others were arrested. Before 1997, most of the anti-communists were supporters of the Kuomintang. They opposed the Communist party's rule in mainland China and its single party dictatorship. Hong Kong has had numerous anti-communist protests, supported by political parties of the pro-democracy camp. Memorials for the Tiananmen Square Massacre of 1989 are held every year in Hong Kong. Tens of thousands people have attended the candlelight vigil. The end of the failed 2014 Umbrella Movement marked a novel and intensified wave of civic nationalism in the territory. Localists have fiercely opposed the Chinese communist rule since Transfer of sovereignty over Hong Kong in 1997, with some calling for independence from China. However, they only take up a small minority in society and have been barred from elections and mainstream domain since the Hong Kong Legislative Council Election in 2016. The Hungarian Revolution of 1956 was a revolt against the government of the Hungarian People's Republic and its Stalinist policies, lasting from 23 October until 10 November 1956. The revolt began as a student demonstration which attracted thousands as it marched through central Budapest to the Parliament building. A student delegation entering the radio building in an attempt to broadcast its demands was detained. When the delegation's release was demanded by the demonstrators outside, they were fired upon by the State Security Police (ÁVH) from within the building. The news spread quickly and disorder and violence erupted throughout the capital. The revolt spread quickly across Hungary and the government fell. After announcing a willingness to negotiate a withdrawal of Soviet forces, the Politburo of the Central Committee of the Communist Party of the Soviet Union changed its mind and moved to crush the revolution. The Indian state is involved in law and order operations against a long-standing Naxalite–Maoist insurgency. Along with this, there are many state-sponsored Anti-Maoist Militias. From October 1965 to the early months of 1966, an estimated 500,000–3,000,000 people were killed by the Indonesian military and allied militia in anti-communist purges which targeted members of the Communist Party of Indonesia and alleged sympathizers. Western governments colluded in the massacres, in particular the United States, which provided the Indonesian military weapons, money, equipment and lists containing the names of thousands of suspected communists. A tribunal in late 2016 declared the massacres a crime against humanity and also named the United States, the United Kingdom and Australia as accomplices to those crimes. Under the Russian Civil War, Japan supported white movements such as Grigory Semyonov's White movement in Transbaikal and Anhui clique's Occupation of Mongolia, but the movements failed and the White Army defected to Manchuria. In 1920, the Zhili–Anhui War was caused and Anhui clique was beaten. In March 1920, under the Nikolayevsk incident Jewish Russian journalist Gutman Anatoly Yakovlevich [ru] began to issue in Tokyo the Delo Rossii [ja], an anti-Bolshevistic Russian newspaper. In June, Romanovsky Georgy Dmitrievich [ru], who had been the chief authorized officer and military representative at the Allied command in the Far East, discussed with the delegate of Semyonov's army Syro-Boyarsky Alexander Vladimirovich [ru] and as the result acquired the Delo Rossii. In July, he began to distribute the translated version of Delo Rossii to noted Japanese officials and non-officials. In 1924, under the Second Zhili–Fengtian War Fengtian clique and the Soviet Union concluded the Fengtian-Soviet Agreement [zh] and the Soviet Union took the half control of the Chinese Eastern Railway and its railway zone. In 1925, the Soviet Union ordered the No.94 Order [ja] to dismiss White Russians from its railway zone. In 1926, Japan founded in Manchuria the Russia Tsūshin [ja], a news agency for gathering of Soviet information. In 1928, Japanese army caused the Huanggutun incident and then Fengtian clique came under the Kuomintang (Northern Expedition). In 1929, Sino-Soviet conflict was caused. Under the conflict, the Siberian self-government [ja], which was according to Grigory Semyonov the successor of the Far Eastern Republic, planned the occupation of Primorsky Krai under Japanese support, but when they negotiated to Kuomintang regime the latter was afraid of White Russian's arming. After the Sino-Soviet conflict, defeated China concluded the Khabarovsk Protocol [zh] which includes the suppression clause of White Army, but Kuomintang regime disturbed the conclusion of the treaty based on the protocol. In 1932, Japan established Manchukuo in Manchuria and then the Manchukuo founded the Bureau of Russian immigrants [ru] to protect the White Russians in 1934. In 1933, Japan participated in the ninth conference of the International Entente Against the Third International and founded the Association for the Study of International Socialistic Ideas and Movements (Japanese: 国際思想研究会). In summer 1935, Comintern held the Seventh World Congress of the Comintern in which they set Japan and Germany as the communizing targets and the Chinese Communist Party declared the August 1 Declaration. After that, Japan defined anti-communistic "Three Principles of HIROTA" for relations with China and also Japan concluded the Anti-Comintern Pact with Germany. After the concluding, International Anti-communist League [ja] was founded in 1937 and the organization held the National Commemoration Ceremony of the Anti-Comintern Pact [ja] in 1938. In March 1935, Manchukuo purchased the North Manchuria Railway and its railway zone from the Soviet Union (Agreement for the cession to Manchukuo of the rights of Soviet Union concerning the North Manchuria Railway [ja]). The residents (Harbin Russians) who had Soviet nationality emigrated to the Soviet Union. In 1937, the Soviet Union ordered the NKVD Order No. 00593 to get rid of the relevant people of the White Russian. In June 1938, under the Great Purge the Far Eastern Commander of the NKVD Genrikh Lyushkov defected to Japan. The note of Lyushkov was issued by Japanese authorities, but The New York Times judged the note was a "Diary for Japanese Schoolboy". In November 1938, Prime Minister Fumimaro Konoe declared the anti-communistic New Order in East Asia [ja]. In 1940, Japan, Manchukuo and Reorganized National Government of the Republic of China declared the Japan-Manchukuo-China Joint Declaration [ja] which is based on the New Order in East Asia. 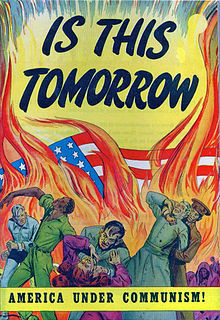 In 1948–1951, during the period of American occupation a "red purge" occurred in Japan in which over 20,000 people accused of being Communists were purged from their places of employment. Before the founding of the People's Republic of China, the Kuomintang was ruling China and strongly opposed the Communist Party of China, causing the Chinese Civil War. The Kuomintang lost the war and went into exile in Taiwan while the rest of China became Communist in 1949. The Chinese democracy movement is a loosely organized anti-communist movement in the People's Republic of China. The movement began during Beijing Spring in 1978 and played an important role in the Tiananmen Square protests of 1989. The 1959 Tibetan Rebellion had some anti-communist leanings. In the 1990s, the movement underwent a decline both within China and overseas and it is currently fragmented and most analysts do not consider it a serious threat to Communist rule. Charter 08 is a manifesto signed by over 303 Chinese intellectuals and human rights activists to promote political reform and democratization in the People's Republic of China. It declares a calling for greater freedom of expression and for free elections. It was published on 10 December 2008 (the 60th anniversary of the Universal Declaration of Human Rights) and its name is a reference to Charter 77, issued by dissidents in Czechoslovakia. Since its release, more than 8,100 people inside and outside China have signed the charter. Vladimir Lenin saw Poland as the bridge which the Red Army would have to cross in order to assist the other Communist movements and help bring about other European revolutions. Poland was the first country which successfully stopped a Communist military advance. Between February 1919 and March 1921, Poland's successful defence of its independence was known as the Polish–Soviet War. According to American sociologist Alexander Gella, "the Polish victory had gained twenty years of independence not only for Poland, but at least for an entire central part of Europe". After the German and Soviet invasion of Poland in 1939, the first Polish uprising during World War II was against the Soviets. The Czortków Uprising occurred during 21–22 January 1940 in the Soviet-occupied Podolia. Teenagers from local high schools stormed the local Red Army barracks and a prison in order to release Polish soldiers who had been imprisoned there. In the latter years of the war, there were increasing conflicts between Polish and Soviet partisans and some groups continued to oppose the Soviets long after the war. Between 1944 and 1946, soldiers of the anti-communist armed groups, known as the cursed soldiers, made a series of attacks on communist prisons immediately following the end of World War II in Poland. The last of the cursed soldiers, members of the militant anti-communist resistance in Poland, was Józef Franczak, who was killed with a pistol in his hand by ZOMO in 1963. Poznań 1956 protests were massive anti-communist protests in the People's Republic of Poland. Protesters were repressed by the regime. The Polish 1970 protests (Polish: Grudzień 1970) were anti-Comintern protests which occurred in northern Poland in December 1970. The protests were sparked by a sudden increase in the prices of food and other everyday items. As a result of the riots, brutally put down by the Polish People's Army and the Citizen's Militia, at least 42 people were killed and more than 1,000 were wounded. Solidarity was an anti-communist trade union in a Warsaw Pact country. In the 1980s, it constituted a broad anti-communist movement. The government attempted to destroy the union during the period of martial law in the early 1980s and several years of repression, but in the end it had to start negotiating with the union. The Round Table Talks between the government and the Solidarity-led opposition led to semi-free elections in 1989. By the end of August, a Solidarity-led coalition government was formed and in December 1990 Wałęsa was elected President of Poland. Since then, it has become a more traditional trade union. The Romanian anti-communist resistance movement lasted between 1948 and the early 1960s. Armed resistance was the first and most structured form of resistance against the Communist regime. It was not until the overthrow of Nicolae Ceauşescu in late 1989 that details about what was called "anti-communist armed resistance" were made public. It was only then that the public learned about the numerous small groups of "haiducs" who had taken refuge in the Carpathian Mountains, where some resisted for ten years against the troops of the Securitate. The last "haiduc" was killed in the mountains of Banat in 1962. The Romanian resistance was one of the longest lasting armed movement in the former Soviet bloc. The Romanian Revolution of 1989 was a week-long series of increasingly violent riots and fighting in late December 1989 that overthrew the government of Ceauşescu. After a show trial, Ceauşescu and his wife Elena were executed. Romania was the only Eastern Bloc country to overthrow its government violently or to execute its leaders. The Moldovan anti-communist social movement emerged on 7 April 2009 in major cities of Moldova after the Party of Communists of the Republic of Moldova (PCRM) had allegedly rigged elections. The anti-communists organized themselves using an online social network service, Twitter, hence its moniker used by the media, the Twitter Revolution or Grape revolution. During the 1970s, the right-wing military juntas of South America implemented Operation Condor, a campaign of political repression involving tens of thousands of political assassinations, illegal detentions and tortures of communist sympathizers. The campaign was aimed at eradicating alleged communist and socialist influences in their respective countries and control opposition against the government, which resulted in a large number of deaths. Participatory governments include Argentina, Bolivia, Paraguay, Brazil, Chile and Uruguay, with limited support from the United States. Choi ji-ryong is an outspoken anti-communist cartoonist in South Korea. His editorial cartoons have been critical of Korean presidents Kim Dae-jung and Roh Moo Hyun. Acción Anticomunista [es] was organized in 1932. The Spanish Civil War was fought from 1936 to 1939 between the anti-communist Nationalist faction led by Francisco Franco and the pro-communist Republican faction led by Manuel Azaña. It ended with the capture of Madrid and a complete Nationalist victory in 1939. The first major manifestation of anti-communism in the United States occurred in 1919 and 1920 during the First Red Scare, led by Attorney General Alexander Mitchell Palmer. During the Red Scare, the Lusk Committee investigated those suspected of sedition and many laws were passed in the United States that sanctioned the firings of Communists. The Hatch Act of 1939, which was sponsored by Carl Hatch of New Mexico, attempted to drive Communism out of public work places. The Hatch Act outlawed the hiring of federal workers who advocated the "overthrow of our Constitutional form of government". This phrase was specifically directed at the Communist Party. Later in the spring of 1941, another anti-communist law was passed, Public Law 135, which sanctioned the investigation of any federal worker suspected of being Communist and the firing of any Communist worker. Pat Scanlan emerged in the 1920s as the leading spokesman for an especially pugnacious brand of militant Catholic anti-communism, that of Irish-Americans who, after suffering from 100 years of anti-Catholic prejudice in America, reacted to any criticism of the Church as a bigoted attack on their own hard-won status in American society....He combined a vivid writing style filled with Menckenesque invective, with an unbridled love of controversy. Under Scanlan, the Tablet became the national voice of Irish Catholic anti-communism—and a thorn in the side of New York's Protestants and Jews. Following World War II and the rise of the Soviet Union, many anti-communists in the United States feared that Communism would triumph throughout the entire world and that it would eventually become a direct threat to the United States. There were fears that the Soviet Union and its allies such as People's Republic of China were using their power to forcibly bring countries under Communist rule. Eastern Europe, North Korea, Vietnam, Cambodia, Laos, Malaya and Indonesia were cited as evidence of this. NATO was a military alliance of nations in Western Europe, led by the United States, to halt further Communist expansion in terms of the containment strategy. The deepening of the Cold War in the 1950s saw a dramatic increase in anti-communism in the United States, including the anti-communist campaign known as McCarthyism. Thousands of Americans, such as the filmmaker Charlie Chaplin, were accused of being Communists or sympathizers and many became the subject of aggressive investigations by government committees such as the House Committee on Un-American Activities. As a result of sometimes vastly exaggerated accusations, many of the accused lost their jobs and became blacklisted, although most of these verdicts were later overturned. This was also the period of the McCarran Internal Security Act and the Julius and Ethel Rosenberg trial. After the collapse of the Soviet Union, many records were made public that in fact verified that many of those thought to be falsely accused for political purposes were in fact Communist spies or sympathizers (see Venona Project). It was in this period that Robert W. Welch Jr. organized the John Birch Society, which became a leading force against the "Communist conspiracy" in the United States. During the 1980s, the Ronald Reagan administration pursued an aggressive policy against the Soviet Union and its allies by building up weapons programs, including the Strategic Defense Initiative. The Reagan Doctrine was implemented to reduce the influence of the Soviet Union worldwide by providing aid to anti-Soviet resistance movements, including the Contras in Nicaragua and the Mujahideens in Afghanistan. The accidental downing of Korean Air Lines Flight 007 near Moneron Island by the Soviets on 1 September 1983 contributed to the anti-communism sentiment of the 1980s. KAL 007 had been carrying 269 people, including a sitting Congressman, Larry McDonald, who was a leader in the John Birch Society. The United States government usually argued its anti-communist policies by citing the human rights record of Communist states, most notably the Soviet Union during the Joseph Stalin era, Maoist China, North Korea and the Pol Pot-led anti-Hanoi Khmer Rouge government and the pro-Hanoi People's Republic of Kampuchea in Cambodia. During the 1980s, the Kirkpatrick Doctrine was particularly influential in American politics and it advocated the United States support of anti-communist governments around the world, including authoritarian regimes. In support of the Reagan Doctrine and other anti-communist foreign and defense policies, prominent United States and Western anti-communists warned that the United States needed to avoid repeating the West's perceived mistakes of appeasement of Nazi Germany. In one of the most prominent anti-communist speeches of any President, Reagan labeled the Soviet Union an "evil empire" and anti-communist intellectuals prominently defended the label. In 1987, for instance, in commemoration of the 70th anniversary of the 1917 Bolshevik Revolution, Michael Johns of The Heritage Foundation cited 208 perceived acts of evil by the Soviets since the revolution. In 1993, Congress passed and President Clinton signed Public Law 103-199 for the construction of a national monument to the 100 million victims of Communism. In 2007 President Bush attended its inauguration. Anti-communism became significantly muted after the 1980s–1990s Chinese economic reform and the fall of the Soviet Union and Eastern bloc Communist governments in Europe between 1989 and 1991, the result of which being that fear of a worldwide Communist takeover was no longer a serious concern. However, remnants of anti-communism remain in foreign policy toward Cuba and North Korea. In the case of Cuba, the United States only recently began to terminate its economic sanctions against the country. Tensions with North Korea have heightened as the result of reports that it is stockpiling nuclear weapons and the assertion that it is willing to sell its nuclear weapons and ballistic missile technology to any group willing to pay a high enough price. Ideological restrictions on naturalization in United States law remain in effect, affecting prospective immigrants who were at one time members of a Communist party, the Communist Control Act, which outlaws the Communist Party, still remains in effect, even though it was never enforced by the Federal Government, some states also still have laws banning Communists from working in the state government. Since the 11 September attacks on the United States and the subsequent Patriot Act, overwhelmingly passed by the Congress and signed into law and strongly supported by President George W. Bush, some Communist groups in the United States have faced renewed scrutiny by the government. On 24 September 2010, over 70 FBI agents simultaneously raided homes and served subpoenas to prominent antiwar and international solidarity activists thought to be members of the Freedom Road Socialist Organization (FRSO) in Minneapolis, Chicago and Grand Rapids and visited and attempted to question activists in Milwaukee, Durham and San Jose. The search warrants and subpoenas indicated that the FBI was looking for evidence related to the "material support of terrorism". In the process of raiding an activist's home, FBI agents accidentally left behind a file of secret FBI documents showing that the raids were aimed at people who were or were suspected of being members of the FRSO. The documents revealed a series of questions that agents would ask activists regarding their involvement in the FRSO and their international solidarity work related to Colombia and Palestine. Later, members of the newly formed Committee to Stop FBI Repression held a press conference in Minnesota revealing that the FBI had placed an informant inside the FRSO to gather information prior to the raids. Anti-communist organizations that are located outside Vietnam but also hold demonstrations in Vietnam are Provisional National Government of Vietnam, Khmers Kampuchea-Krom Federation, Viet Tan, People's Action Party of Vietnam, Government of Free Vietnam, Montagnard Foundation, Inc., Vietnamese Constitutional Monarchist League and Nationalist Party of Greater Vietnam. Criticisms of anti-communism and accounts of political repression and economic development under Communist rule are diverse. Supporters of various ruling Communist parties have argued that accounts of political repression are exaggerated by anti-communists and that Communist rule provided some human rights not found under capitalism, such that everyone is treated equal regardless of education, financial stability or anything else, any citizen can keep a job or there is efficient distribution of resources. They further claim that countries under Communist party rule experienced greater economic development than they would have otherwise, or that Communist leaders were forced to take harsh measures to defend their countries against the West during the Cold War. Some Western academics argue that anti-communist narratives have exaggerated the extent of political repression and censorship in states under communist rule. Albert Szymanski, for instance, draws a comparison between the treatment of anti-communist dissidents in the Soviet Union after Stalin's death and the treatment of dissidents in the United States during the period of McCarthyism, claiming that "on the whole, it appears that the level of repression in the Soviet Union in the 1955 to 1980 period was at approximately the same level as in the United States during the McCarthy years (1947–1956). Mark Aarons contends that right-wing authoritarian regimes and dictatorships backed by Western powers committed atrocities and mass killings that rival the Communist world, citing examples such as the Indonesian mass killings of 1965–66 and the killings associated with Operation Condor throughout South America. Writing in Current Affairs in October 2017, editor-in-chief Nathan J. Robinson posits that if "Soviet atrocities indict socialism", then "principled and consistent belief" would hold that "U.S support for the killing of 500,000 Indonesian communists indicts American capitalist democracy". In her 2012 book The Communist Horizon, American political philosopher Jodi Dean argues that two decades after the dissolution of the Soviet Union virulent anti-communism persists on the contemporary political landscape and is embraced by all sides of the political spectrum, including conservatives, liberals, democrats, capitalists and social democrats. She says that a double standard exists in how communism and capitalism are perceived in the popular consciousness. The worst excesses of capitalism, including slavery, unemployment, economic inequality, global warming, robber barons, war and imperialism, the Great Depression and the Great Recession, are often minimized, which allows the history of capitalism to be more dynamic and nuanced. By contrast, Communism is often equated only with the Soviet Union (Communist experiments in Eastern Europe, Latin America, Africa and Asia are often ignored) and then only the twenty-six years of Stalin's rule, with strong emphasis placed on gulags, purges and famines and almost no consideration for the modernization of the economy, the successes of Soviet science (such as the Soviet space program) or the rise in the standard of living for the once predominantly agrarian society. The collapse of the Soviet Union is thus seen as the proof that Communism can not work. This allows for all left-wing criticism of the excesses of neoliberal capitalism to be silenced, for the alternatives will supposedly inevitably result in economic inefficiency and violent authoritarianism. As an example of this alleged double standard, social critic Noam Chomsky has stated in his criticism of The Black Book of Communism by outlining economist Amartya Sen's research on hunger that while India's democratic institutions prevented famines, its excess of mortality over Communist China—potentially attributable to the latter's more equal distribution of medical and other resources—was nonetheless close to 4 million per year for non-famine years. Thus, Chomsky argued that "supposing we now apply the methodology of the Black Book" to India, "the democratic capitalist "experiment" has caused more deaths than in the entire history of [...] Communism everywhere since 1917: over 100 million deaths by 1979, and tens of millions more since, in India alone". Other academics and journalists, among them Kristen Ghodsee and Seumas Milne respectively, assert that in the post-Cold War era any narratives which include Communism's achievements are often ignored while those which focus exclusively on the crimes of Stalin and other Communist leaders are amplified. Both allege this is done in part to silence any criticism of global capitalism. Michael Parenti holds that communist regimes, as flawed as they were, nevertheless played a role in "tempering the worst impulses of Western capitalism and imperialism", and chastises left-wing anti-communists in particular for failing to understand that in the post-Cold War era, Western business interests are "no longer restrained by a competing system," and are now "rolling back the many gains that working people in the West have won over the years." He adds "some of them still don't get it." ^ Harvey A. Levenstein, Communism, anti-communism, and the CIO (1981). ^ Markku Ruotsila, British and American Anti-communism Before the Cold War (2001). ^ Paul Corthorn and Jonathan Davis (2007). British Labour Party and the Wider World: Domestic Politics, Internationalism and Foreign Policy. I.B.Tauris. p. 105. ^ Selected Writings on Anarchism and Revolution, P.A. Kropotkin Anarchist Archives. ^ Politics and Participation under Communist Rule by Peter J. Potichnyj and Jane Shapiro Zacek (1983). ^ Bellamy, Richard (2003). The Cambridge History of Twentieth-Century Political Thought. Cambridge University Press. p. 60. ISBN 0-521-56354-2. ^ Robert Mayhew, Ayn Rand and Song of Russia: Communism and Anti-Communism in 1940s Hollywood (2004). ^ Ayn Rand, Capitalism: the Unknown Ideal, 1966, New American Library. ^ "Polish anti-Marxist thinker dies", Adam Easton, BBC News, 17 July 2009. ^ Chambers, Whittaker (1952). Witness. Random House. ISBN 0-89526-571-0. ^ John Diggins, Up From Communism, Harper & Row, 1975. ^ Richard Crossman, The God That Failed (1949). ^ John Chamberlain, A Life With the Printed Word, Regnery, 1982, p. 136. ^ Friedrich Hayek, The Fatal Conceit: The Errors of Socialism, 1988. ^ Raymond Moley, After Seven Years, 1939. ^ Irving Kristol, Neoconservatism: The Autobiography of an Idea, 1995. ^ "The Women They Feared". ^ Walter Laqueur. Fascism – A Reader's Guide: Analyses, Interpretations, Bibliography. Berkeley and Los Angeles, California, University of California Press, 1976. pp. 16–17. ^ Waddington, Lorna L. (2007). 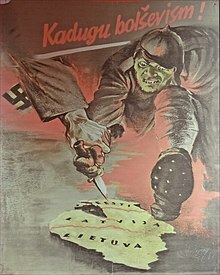 "The Anti-Komintern and Nazi Anti-Bolshevik Propaganda in the 1930s". Journal of Contemporary History. 42 (4): 573–594. doi:10.1177/0022009407081488. JSTOR 30036470. ^ Serguei Glebov, "'Congresses of Russia Abroad' in the 1920s and the Politics Of Émigré Nationalism", Ab Imperio (2000), issue 3/4, pp. 159–185. ^ G. Bruce Strang, "The Spirit of Ulysses? Ideology and British Appeasement in the 1930s", Diplomacy & Statecraft (2008) 19#3 pp. 481–526. ^ Carroll Quigley, Tragedy and Hope, 1966, p. 619. ^ "Breaking News, World News & Multimedia". International Herald Tribune. ^ "CCC Search Result – Paragraph # 2425". scborromeo.org. ^ "Pope John Paul's crusade against communism". CNN. ^ Pius IX. Quanta cura (Condemning Current Errors). 8 December 1864. Retrieved 27 November 2007 from EWTN.com. ^ Controversial New Religions, The Falun Gong: A New Religious Movement in Post-Mao China, David Ownby p. 195 ISBN 0-19-515683-8. ^ Reid, Graham (29 Apr–5 May 2006) "Nothing left to lose", New Zealand Listener. Retrieved 6 July 2006. ^ Danny Schechter, Falun Gong's Challenge to China: Spiritual Practice or Evil Cult?, Akashic books: New York, 2001, p. 66. ^ a b "The crackdown on Falun Gong and other so-called "heretical organizations"". 23 March 2000. Archived from the original on 11 July 2003. Retrieved 11 July 2003. , Amnesty International. ^ Thomas Lum (25 May 2006). "CRS Report for Congress: China and Falun Gong" (PDF). Congressional Research Service. ^ a b c David Kilgour, David Matas (6 July 2006, revised 31 January 2007) "An Independent Investigation into Allegations of Organ Harvesting of Falun Gong Practitioners in China" (free in 22 languages) organharvestinvestigation.net. ^ Sunny Y. Lu, MD, PhD, and Viviana B. Galli, MD, "Psychiatric Abuse of Falun Gong Practitioners in China", J Am Acad Psychiatry Law, 30:126–30, 2002. ^ Robin J. Munro, "Judicial Psychiatry in China and its Political Abuses", Columbia Journal of Asian Law, Columbia University, Volume 14, Number 1, Fall 2000, p. 114. ^ "Chinese dissidents take on Beijing via Media Empire", The Wall Street Journal. ^ Ethan Gutmann (August 2014) The Slaughter: Mass Killings, Organ Harvesting and China's Secret Solution to Its Dissident Problem "Average number of Falun Gong in Laogai System at any given time" Low estimate 450,000, High estimate 1,000,000 p 320. "Best estimate of Falun Gong harvested 2000 to 2008" 65,000 p. 322. ^ Reuters, "Argentine judge asks China arrests over Falun Gong", 22 December 2009. ^ Genocide Prevention Network, 'Spanish Court Indicts Chinese Leaders for Persecution of Falun Gong'. ^ Rosalind Marsh (2017). Images of Dictatorship: Stalin in Literature. Taylor & Francis. p. 99. ^ Edward Saunders (2017). Arthur Koestler. Reaktion Books. pp. 59–60. ^ Charles W. Dunn; J. David Woodard (2003). The Conservative Tradition in America. Rowman & Littlefield. p. 106. ^ Peter Finn; Petra Couvée (2014). The Zhivago Affair: The Kremlin, the CIA, and the Battle Over a Forbidden Book. Knopf Doubleday. p. 189. ^ "Literaturnobelpreis geht an Herta Müller". ^ "Goethe-Institut Boston – Goethe-Institut USA". goethe.de. ^ Anamaria Dutceac Segesten, "The Post-Communist Afterlife of Dissidents: The Case of Herta Müller". in M. Schoenhals; K. Sarsenov (2013). Imagining Mass Dictatorships: The Individual and the Masses in Literature and Cinema. Springer. pp. 28–51. ^ Walter Sawatsky (2007). Soviet Evangelicals since World War II. Wipf & Stock. p. 405. ^ "Europe ponders 'remembrance day' for communist, Nazi past". euractiv.com. ^ Robert Elsie. "Mid'hat bey Frashëri: The Epirus Question – the Martyrdom of a People". Archived from the original on 23 July 2011. Retrieved 18 June 2011. ^ Thanas Mustaqi (23 September 2011), 1949, Pentagoni: Diplomaci fleksibël me Shqipërinë [1949, Pentagon:Flexible diplomacy with Albania] (in Albanian), Lajmi, archived from the original on 22 December 2014, retrieved 19 December 2014, Më 26 gusht të vitit 1949, në Paris u formua Komiteti Kombëtar-Demokratik "Shqipëria e lirë", me nismën e Mithat Frashërit për të "udhëhequr dhe inkurajuar njerëzit tanë të zotë në rezistencën e tyre kundër tiranisë komuniste". Këtu u zgjodh edhe Këshilli udhëheqës i saj i përbërë nga Mid'hat Frashëri (kryetar), Abas Kupi, Zef Pali, Said Kryeziu dhe Nuçi Kotta (anëtarë). Organi më i lartë ishte Këshilli Kombëtar prej 11 anëtarësh nga parti të ndryshme. Por pas disa ditësh, agjencia franceze e lajmeve AFP transmetoi një deklaratë të Mbretit në mërgim Ahmet Zogu, në të cilën thuhej se nuk e njihte Komitetin Shqipëria e Lirë dhe se "pas 7 prillit 1939, unë jam i vetmi autoritet legjitim i shqiptarëve". ^ Miranda Leitsinger. "Organizers: 150,000 at Tiananmen vigil in Hong Kong - CNN". CNN. ^ Mark Aarons (2007). "Justice Betrayed: Post-1945 Responses to Genocide." In David A. Blumenthal and Timothy L. H. McCormack (eds). The Legacy of Nuremberg: Civilising Influence or Institutionalised Vengeance? (International Humanitarian Law). Martinus Nijhoff Publishers. ISBN 9004156917 p. 80. ^ Robinson, Geoffrey B. (2018). The Killing Season: A History of the Indonesian Massacres, 1965–66. Princeton University Press. p. 3. ISBN 978-1-4008-8886-3. ^ "Looking into the massacres of Indonesia's past". BBC News. 2 June 2016. Retrieved 29 October 2017. ^ Simpson, Bradley (2010). Economists with Guns: Authoritarian Development and U.S.–Indonesian Relations, 1960–1968. Stanford University Press. p. 193. ISBN 0804771820. Washington did everything in its power to encourage and facilitate the army-led massacre of alleged PKI members, and U.S. officials worried only that the killing of the party's unarmed supporters might not go far enough, permitting Sukarno to return to power and frustrate the [Johnson] Administration's emerging plans for a post-Sukarno Indonesia. ^ Kai Thaler (2 December 2015). 50 years ago today, American diplomats endorsed mass killings in Indonesia. Here’s what that means for today. The Washington Post. Retrieved 2 December 2015. ^ Scott, Margaret (26 October 2017). "Uncovering Indonesia's Act of Killing". The New York Review of Books. Retrieved 4 March 2018. ^ Perry, Juliet (21 July 2016). "Tribunal finds Indonesia guilty of 1965 genocide; US, UK complicit". CNN. Retrieved 8 July 2017. ^ "Over 5000 people have signed the Charter 08 (《零八宪章》签名已超过5000人)". Boxun. 17 December 2008. Retrieved 15 December 2008. ^ Spencer, Richard (9 December 2008). "Chinese dissidents emulate anti-Soviet heroes with Charter 08". The Daily Telegraph. London. Archived from the original on 10 December 2008. Retrieved 10 December 2008. ^ Why China's leadership should talk to the Charter 08 movement, The Washington Post, 30 January 2009. ^ Small green shoots of rebellion among ordinary Chinese, The Irish Times, 31 January 2009. ^ Graham-Harrison, Emma. "'I'm still nervous,' says soldier who shot Nicolae Ceausescu". The Guardian. Retrieved 10 August 2017. ^ Klein, Naomi (2007). Shock Doctrine. New York: Picador. p. 126. ISBN 978-0-312-42799-3. ^ J. Patrice McSherry. Predatory States: Operation Condor and Covert War in Latin America. Rowman & Littlefield Publishers, 2005. p. 36. ISBN 0742536874. ^ Evans, M. S. Blacklisted by History: The Untold Story of Senator Joe McCarthy and His Fight Against America's Enemies. New York: Crown Forum, 2007. ^ Richard Gid Powers (1998). Not Without Honor: The History of American Anticommunism. Yale UP. pp. 55–57. ^ "Cite Soviets' Dark Side While Holding U.S. to High Standards," by Howard Means, The Orlando Sentinel, November 17, 1987. ^ "Seventy Years of Evil: Soviet Crimes from Lenin to Gorbachev", by Michael Johns, Policy Review, The Heritage Foundation, Fall 1987. ^ JONATHAN RAUCH (1 December 2003). "The Forgotten Millions". The Atlantic. Retrieved 14 July 2018. in 1993 Congress and President Bill Clinton authorized the construction, on public land but with private funds, of a national memorial to honor the victims of communism. The act cited "the deaths of over 100,000,000 victims in an unprecedented imperial communist holocaust," and resolved that "the sacrifices of these victims should be permanently memorialized so that never again will nations and peoples allow so evil a tyranny to terrorize the world." ^ Editorial, Reuters. "China blasts Bush tribute to victims of communism". Reuters. ^ "Timeline of Events 2010". Committee to Stop FBI Repression. Retrieved 25 April 2013. ^ "FBI Interview Questions for FRSO" (PDF). Committee to Stop FBI Repression. Retrieved 25 April 2013. ^ Szymanski, Albert (1984). Human Rights in the Soviet Union. p. 291. ^ Aarons, Mark (2007). "Justice Betrayed: Post-1945 Responses to Genocide". In Blumenthal, David A.; McCormack, Timothy L. H. (eds). The Legacy of Nuremberg: Civilising Influence or Institutionalised Vengeance? (International Humanitarian Law). Martinus Nijhoff Publishers. pp. 71 and 80–81. ISBN 9004156917. ^ Robinson, Nathan J. (28 October 2017). "How to be a Socialist without being an Apologist for the Atrocities of Communist Regimes". Current Affairs. Retrieved 30 October 2017. ^ Dean, Jodi (2012). The Communist Horizon. Verso. pp. 6–7. ISBN 978-1844679546. ^ Ghodsee, Kristen R. (2015). The Left Side of History: World War II and the Unfulfilled Promise of Communism in Eastern Europe. Duke University Press. p. xvi–xvii. ISBN 978-0822358350. ^ Ehms, Jule (2014). "The Communist Horizon". Marx & Philosophy Society. ^ Chomsky, Noam. "Counting the Bodies". Spectrezine. Archived from the original on 21 September 2016. Retrieved 18 September 2016. ^ Chomsky, Noam (2000). Rogue States: The Rule of Force in World Affairs. Pluto Press. p. 178. ISBN 978-0-7453-1708-3. ^ Ghodsee, Kristen R. (2014). "A Tale of 'Two Totalitarianisms': The Crisis of Capitalism and the Historical Memory of Communism" (PDF). History of the Present. 4 (2): 115–142. JSTOR 10.5406/historypresent.4.2.0115. ^ Milne, Seumas (16 February 2006). "Communism may be dead, but clearly not dead enough". The Guardian. Retrieved 5 September 2018. Kennan, George F. (1964). On Dealing with the Communist World, in series, The Elihu Root Lectures. New York: Harper & Row. xi, 57 p. N.B. : Also on t.p. : "Published for the Council on Foreign Relations". Gülstorff, Torben (2015). Warming Up a Cooling War: An Introductory Guide on the CIAS and Other Globally Operating Anti-communist Networks at the Beginning of the Cold War Decade of Détente, in series, Cold War International History Project Working Paper Series #75, Washington. Stephane Courtois (1997). The Black Book of Communism. Foundation for the Investigation of Communist Crimes. Russians In Support of the Idea of International Condemnation of Communism. An open letter from leaders of Russian Anti-Communist Organizations to the Parliamentary Assembly of the Council of Europe. Michael Johns (fall 1987). "Seventy Years of Evil: Soviet Crimes from Lenin to Gorbachev". Policy Review. The Victims of Communism Memorial Foundation. Ghodsee, Kristen R.; Sehon, Scott (22 March 2018). "Anti-anti-communism". Aeon. Retrieved 14 October 2018.